A respected mountaineer has relived the moment he fell from one of the world’s tallest slopes. Rick Allen was feared dead after he did not return from a solo climb to the summit of the 26,400ft Himalayan Broad Peak last week. But 36 hours later he was spotted by a drone and eventually rescued with frostbitten toes. The 63-year-old, from Aboyne, had set off on his own on Tuesday after his companions – including regular walking partner and mountain guide Sandy Allan, from Newtonmore – decided to stay at their camp due to high winds. However, as he was making his way down the cliff face he lost his footing and slipped before falling a considerable distance. He said: “I dropped vertically and I don’t recollect the impact but I must have passed out and then woke up to find myself in a heap of snow. “I started to feel my limbs to make sure everything was intact, there was a lot of blood but it was coming from my nose and my face. Everything else was OK.
Mr Allen then began to descend the mountain again, attempting to find the path which he had strayed off, hoping to return to his camp. But he suffered a major set back when he realised he had gone too far – prompting him to then try and go up and along to where he believed his camp was. Battling fatigue, freezing temperatures and the after-effects of his fall, Mr Allen then began hallucinating about being rescued. “I would lapse into this semi-conscious state where I would be having full conversations with imaginary people,” he said. “They were telling me to check in so I could get on a helicopter, and saying ‘you don’t see anyone else around here climbing a mountain’. In the meantime, his desperate friends back at camp had started to fear the worst and reports began circulating online that he had died. But in a lucky twist, Mr Allen dropped his rucksack and head torch as he was making his way down – which were spotted by a base camp cook. Polish brothers Andrzej and Bartek Bargiel, who are attempting the first ever ski down the mountain, offered to use their drone to help in the search, focusing on the area where the items were found. Initially Mr Allen thought the drone was part of his hallucinations, but after seeing it again several hours later he realised the search was ongoing. A short time later, Mr Allen’s fellow climbers, along with sherpas, located him and he was flown off the mountain, suffering from frostbite. Now recovering back at home in Deeside – where his doctor has firsthand experience of frostbite, having worked in Antarctica for three years – Mr Allen has vowed to be back up in the hills in no time. He has survived an avalanche and other extreme situations in the past, and admitted he did have to overcome fear following the initial fall. “It was definitely an issue, especially when I woke up and realised I’d dropped a considerable distance. Mr Allen’s long-time climbing partner, Sandy Allan, told the BBC: “He is a tough and strong-willed man and also incredibly lucky that a cook and then the drone spotted him. 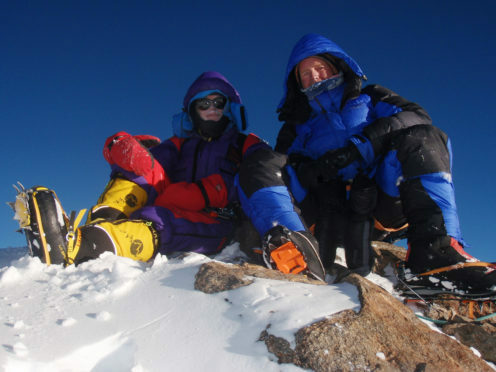 Both men are widely respected mountaineers, and in 2012 completed what was described as the last great unclimbed route in the Himalayas.